Finally, I made it to Alaska. For some, it’s hard to believe that I had never made it to our northern most, largest and most remote state. After being up there for two weeks poking around, it was hard to think about leaving. My first adventure was a bit impromptu. I drove the Steward Highway and found myself going on a day-hike along side of Exit Glacier. The notable point however being that I was carrying a backpack with overnight equipment. There was a rumor of a small storm shelter somewhere up there near the Harding Icefield. Nevertheless, I was prepared to camp in the snow or tundra or on the rocks if need be. Just rounding the bend in the road and catching your first glimpse of the glacier is impressive. A huge tongue of white rests in the steep hold of rocky ridges on either side. The base of the glacier tapers to a gentle rounded point, constrained by the gray piles of lateral moraines. A cloudy gray river flows out from the blue cave and twists through the ever changing channels of the broad outwash field that resembles a broad riverbed. In a way, it was once a river bed, for a river of ice. 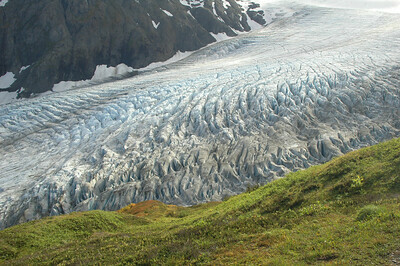 The glacier is indeed flowing down, but the terminus is steadily moving closer and closer to its source. Along the road and the trail leading right to the toe of the glacier are year markers showing how far down the river valley the white tongue used to reach. The weather was perfect: partially cloudy, strong sunbeams, mild temperature and dry ground. The hike up along side Exit Glacier wasn’t exactly right along side the glacier, but the trail did offer occasional glimpses of the impressive ice river. Once the altitude beat the trees and shrubs down to low-lying alpine tundra grasses and such the trail was well above the glacier and the views offered to inspect it all from above was impressive. Hundreds of huge crevasses gaped open like zebra stripes until the upper reaches of the glacier where it blended back into the parent icefield – Harding Icefield. Remnant from the last ice age the Harding Icefield feeds over 40 glaciers like Exit Glacier across the Kenai Mountains. Most of these flow directly into the sea, which in part is how Exit Glacier got it’s name, being the glacier used as the exit for the first party to cross the Harding Icefield because it was one of the few glaciers that took them back to land. After crossing a large boulder field and traversing the slope of the ridge holding the glacier in it’s little ravine I found the shelter, a simple single room the size of a parking space stoutly built to handle the fierce winters. Being so far north, the sun took an exceptionally long time to set (quite the opposite from the sunsets on Kilimanjaro just three degrees south of the equator). I had plenty of time to take lots of photos and enjoy the scenery and serenity of a gentle breeze blowing across the vast sea of white – the Harding Icefield. It was a cool night and a stove would have been a nice thing to have. Both to provide a warm dinner and for a comforting cup of tea in the morning. No matter, my ration of Nutella and PB sandwiches did keep the home fire burning and the beauty all around me was sufficiently distracting. The sun rose early and without the distraction of a warm breakfast, I was able to commit my efforts towards photographing the sunrise and related images. Packing was a snap and I was soon heading back across the snow patches to the trail descending back down into the valley. I didn’t start coming across upward hikers until about half way down. There was quite a lot of them to show how popular this trail is as a day hike. And it’s no surprise considering Exit Glacier is one of the few glaciers so close to the road and easily accessed. A heavy gray cloud obscured the peaks as I descended along Exit Glacier and it was overcast by the time I popped out at the USFS information center. This entry is filed under: Blog, Earth, Hike, North America, Video.